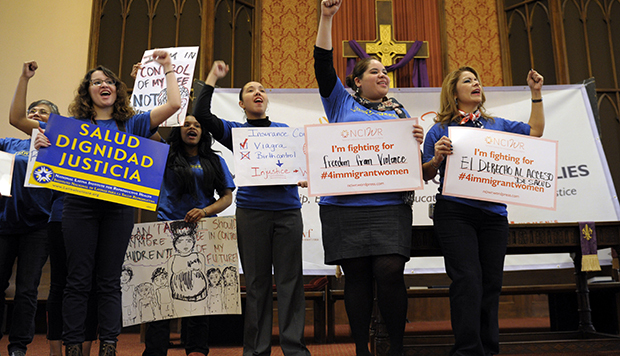 The movement toward comprehensive immigration reform has accelerated significantly in recent months. A bipartisan “Gang of 8” in the Senate—a group of four Democratic senators and four Republican senators—released a framework for immigration reform on January 28, and the next day President Barack Obama gave a speech launching White House efforts to push for immigration reform. Both proposals contained strong language regarding the need to provide legal status for the 11 million undocumented immigrants living in the country, as well as a road map to full citizenship. Some lawmakers, however, do not want to extend legal status—let alone citizenship—to the unauthorized. Others have expressed interest in stopping just short of providing full citizenship for the 11 million undocumented immigrants, instead calling for a so-called middle-ground option—to leave undocumented immigrants in a permanent subcitizen status. To be sure, the debate over immigration reform has important legal, moral, social, and political dimensions. Providing or denying legal status or citizenship to the undocumented has implications for getting immigrants in compliance with the law, affects whether or not immigrant families can stay in their country of choice, and determines whether they have the opportunity to become full and equal members of American society. But legal status and citizenship are also about the economic health of the nation as a whole. As our study demonstrates, legal status and a road map to citizenship for the unauthorized will bring about significant economic gains in terms of growth, earnings, tax revenues, and jobs—all of which will not occur in the absence of immigration reform or with reform that creates a permanent sub-citizen class of residents. We also show that the timing of reform matters: The sooner we provide legal status and citizenship, the greater the economic benefits are for the nation. The logic behind these economic gains is straightforward. As discussed below, legal status and citizenship enable undocumented immigrants to produce and earn significantly more than they do when they are on the economic sidelines. The resulting productivity and wage gains ripple through the economy because immigrants are not just workers—they are also consumers and taxpayers. They will spend their increased earnings on the purchase of food, clothing, housing, cars, and computers. That spending, in turn, will stimulate demand in the economy for more products and services, which creates jobs and expands the economy. This paper analyzes the 10-year economic impact of immigration reform under three scenarios. The first scenario assumes that legal status and citizenship are both accorded to the undocumented in 2013. The second scenario assumes that the unauthorized are provided legal status in 2013 and are able to earn citizenship five years thereafter. The third scenario assumes that the unauthorized are granted legal status starting in 2013 but that they are not provided a means to earn citizenship—at least within the 10-year timeframe of our analysis. Under the first scenario—in which undocumented immigrants are granted legal status and citizenship in 2013—U.S. gross domestic product, or GDP, would grow by an additional $1.4 trillion cumulatively over the 10 years between 2013 and 2022. What’s more, Americans would earn an additional $791 billion in personal income over the same time period—and the economy would create, on average, an additional 203,000 jobs per year. Within five years of the reform, unauthorized immigrants would be earning 25.1 percent more than they currently do and $659 billion more from 2013 to 2022. This means that they would also be contributing significantly more in federal, state, and local taxes. Over 10 years, that additional tax revenue would sum to $184 billion—$116 billion to the federal government and $68 billion to state and local governments. Under the second scenario—in which undocumented immigrants are granted legal status in 2013 and citizenship five years thereafter—the 10-year cumulative increase in U.S. GDP would be $1.1 trillion, and the annual increases in the incomes of Americans would sum to $618 billion. On average over the 10 years, this immigration reform would create 159,000 jobs per year. Given the delay in acquiring citizenship relative to the first scenario, it would take 10 years instead of five for the incomes of the unauthorized to increase 25.1 percent. Over the 10-year period, they would earn $515 billion more and pay an additional $144 billion in taxes—$91 billion to the federal government and $53 billion to state and local governments. Finally, under the third scenario—in which undocumented immigrants are granted legal status starting in 2013 but are not eligible for citizenship within 10 years—the cumulative gain in U.S. GDP between 2013 and 2022 would still be a significant—but comparatively more modest—$832 billion. The annual increases in the incomes of Americans would sum to $470 billion over the 10-year period, and the economy would add an average of 121,000 more jobs per year. The income of the unauthorized would be 15.1 percent higher within five years. Because of their increased earnings, undocumented immigrants would pay an additional $109 billion in taxes over the 10-year period—$69 billion to the federal government and $40 billion to state and local governments. These immigration reform scenarios illustrate that unauthorized immigrants are currently earning far less than their potential, paying much less in taxes, and contributing significantly less to the U.S. economy than they potentially could. They also make clear that Americans stand to gain more from an immigration reform policy of legalization and citizenship than they do from one of legalization alone—or from no reform at all. Finally, the magnitude of potential economic gains depends significantly on how quickly reforms are implemented. The sooner that legal status and citizenship are granted to the unauthorized, the greater the gains will be for the U.S. economy. Numerous studies and government data sets have shown that positive economic outcomes are highly correlated with legal status and citizenship. Large and detailed government datasets—such as the U.S. Census Bureau’s American Community Survey and Current Population Survey—have documented, for example, that U.S. citizens have average incomes that are 40 percent greater or more than the average incomes of noncitizen immigrants, both those here legally and the unauthorized. Within the immigrant community, economic outcomes also vary by legal status. A study done by George Borjas and Marta Tienda found that prior to 1986 Mexican immigrant men legally in the United States earned 6 percent more than unauthorized Mexican male immigrants. Research suggests that undocumented immigrants are further “underground” today than they were in 1986—and that they experience an even wider wage gap. Katherine Donato and Blake Sisk, for example, found that between 2003 and 2009, the average hourly wage of Mexican immigrants legally in the United States was 28.3 percent greater than it was for undocumented Mexican immigrants. In addition, a U.S. Department of Labor study—based on a carefully constructed and large longitudinal survey of the nearly 3 million unauthorized immigrants who were granted legal status and given a road map to citizenship under the Immigration Reform and Control Act of 1986—found that these previously undocumented immigrants experienced a 15.1 percent increase in their average inflation-adjusted wages within five years of gaining legal status. Studies have also reported that citizenship provides an added economic boost above and beyond the gains from legalization. Manuel Pastor and Justin Scoggins, for instance, found that even when controlling for a range of factors such as educational attainment and national origin, naturalized immigrants earned 11 percent more than legal noncitizens. There are several reasons why legalization and citizenship both raise the incomes of immigrants and improve economic outcomes. Providing a road map to citizenship to undocumented immigrants gives them legal protections that raise their wages. It also promotes investment in the education and training of immigrants that eventually pays off in the form of higher wages and output; grants access to a broader range of higher-paying jobs; encourages labor mobility which increases the returns on the labor skills of immigrants by improving the efficiency of the labor market such that the skillsets of immigrants more closely match the jobs that they perform; and makes it more possible for immigrants to start businesses and create jobs. Each of these reasons is explained in more detail below. Legalization allows the newly authorized to invoke the numerous employment rights that they previously could not benefit from—but were in most cases entitled to—due to their constant fear of being deported. Providing unauthorized workers with legal status increases their bargaining power relative to their employers, which in turn lowers the likelihood of worker exploitation and suppressed wages. This means that newly legal immigrants will be better equipped to contest an unlawful termination of employment, to negotiate for fair compensation or a promotion, and to file a complaint if they believe they are being mistreated or abused. Citizenship provides even greater protections than legalization. Citizens, for example, cannot be deported, while immigrants who are legal residents are still subject to deportation under certain circumstances. Legal status and a road map to citizenship both provide a guarantee of long-term membership in American society and cause noncitizen immigrants to invest in their English language skills and in other forms of education and training that raise their productivity. Research shows that legal status and a road map to citizenship both create the opportunity and incentive for workers to invest in their labor-market skills at a greater rate than they otherwise would: Nearly 45 percent of the wage increases experienced by newly legalized immigrants is due to upgrades in their human capital. Similarly, a Department of Labor study of newly legalized immigrants found that they had significantly improved their English language skills and educational attainment within five years of gaining legal status and a road map to citizenship. Undocumented immigrants are not legally living in the country, nor are they legally permitted to work here. Expensive federal- and state-level employer sanctions on the hiring of undocumented workers further restrict their access to fairly compensated and legal work opportunities because employers are reluctant to hire immigrants. If they do hire immigrants, they may use the threat of these sanctions to justify paying immigrants lower wages than they are due. Legalization, investment in education and training, and access to better jobs leads to greater returns on the labor skills and education of undocumented immigrants. The undocumented also experience increasing returns from the improved labor-market mobility that follows legalization. Prior to legalization, unauthorized immigrants are subject to deportation if they are apprehended and, therefore—regardless of their skills—they tend to pursue employment in low-paying occupations, such as farming, child care, and cleaning services, where their legal status is less likely to be discovered. Thus, unauthorized workers do not receive the same market returns on their skills that comparable but legal workers receive. Prior to legalization, a high school diploma does not result in a statistically significant wage premium over those without this education. After legalization, however, “having a high school diploma or education beyond high school” results in an 11 percent wage premium. In other words, the returns on the labor skills of the legalized improve in part because workers move to sectors where their skills and education are both valued and relevant to the work being conducted. Hence, legalization and citizenship improve the efficiency of the labor market by ensuring that people are working in fields where their skillsets and training are being used to the fullest extent. Legal status and citizenship facilitate noncitizen-immigrant entrepreneurship by providing access to licenses, permits, insurance, and credit to start businesses and create jobs. Despite the legal obstacles to entrepreneurship that noncitizens currently face, the U.S. economy benefits significantly from immigrant innovators. Immigrants—both legal and unauthorized—are more likely to own a business and start a new business than are nonimmigrants. Immigration reform that untethers the creative potential of immigrant entrepreneurs therefore promotes economic growth, higher incomes, and more job opportunities. In this study, we reach similar findings on the positive earnings impacts of legalization and citizenship on immigrants. We extend the analysis to report the effect that they have on U.S. tax receipts and the overall U.S. economy. Specifically, we analyze what happens to U.S. GDP, personal income, jobs, tax revenues, and the earnings of the 11 million unauthorized immigrants under the three immigration scenarios described above. A good place to start examining the effect of the undocumented following a road map to citizenship is to compare them to a group that has already followed a similar map: those immigrants who are currently naturalized citizens. In doing such an analysis, we cannot simply assume that the current undocumented population would earn and contribute as much as the present class of naturalized-immigrant citizens has should they obtain the same status. The immigrants who have already become citizens are not necessarily the same in other economically relevant ways—they may, for example, differ in their educational attainment and age. We deal with this possibility by using a regression analysis that controls for these factors to estimate the economic impact that legal status and citizenship have on the nation and its unauthorized immigrant population. As a first step, we provide an estimate of the income effect of providing citizenship to all noncitizen immigrants, including both those here legally and the unauthorized. We then disaggregate this estimate to calculate the income effect of providing legal status and citizenship to unauthorized immigrants only. In our analysis, we estimate that the income premium of citizenship for all immigrants—both documented and undocumented—by comparing the earnings of naturalized and noncitizen immigrant populations while statistically controlling for observable differences other than citizenship that may affect income-level differences between the two groups. We control for education level; work experience; age; year of arrival in the United States; race/ethnicity; gender differences; country of origin; state of residency; rural versus urban residence; and marital status of naturalized and noncitizen immigrant populations to estimate the effect that citizenship has on earnings. We do so because these factors are likely to be responsible for differences in the earnings of naturalized immigrants and noncitizen immigrants—differences that would remain even if all noncitizens acquired citizenship. We know, for example, that noncitizen immigrants are younger, less educated, and less advanced in their careers than naturalized citizens—differences that would continue to affect the relative earnings of both groups after acquisition of citizenship. We find that citizenship is associated with a statistically significant boost in the incomes of immigrants—an average of 16 percent (17.1 percent for women and 14.5 percent for men) in 2011. Of course, there is no policy being contemplated today whereby all noncitizens would become citizens. And since our regression analysis mixes already-documented legal noncitizens with undocumented noncitizens, it does not measure the effect of a policy change aimed only at the undocumented. But it does give a good indication of the impact over time of moving people from being unauthorized to legal noncitizens to naturalized citizens—the details of which we disaggregate in the next section of this paper. Our finding that the income effect of citizenship is positive and significant is consistent with the results of other studies. We provide more details on the findings of these other studies in the appendix. If we made the assumption that the income effect of legalization and citizenship combined for the unauthorized is the same as the income effect of citizenship that we estimated for the entire noncitizen immigrant population, then we would conclude that the unauthorized would experience an average increase in income of 16 percent from legalization and citizenship. This estimate, however, understates the true income effect for the unauthorized population because it aggregates the relatively smaller income gains that legal noncitizens get from citizenship alone with the relatively larger income gains that the unauthorized get from legalization and citizenship. In addition, our regression estimate further understates the income effect of citizenship for the unauthorized because the unauthorized are undercounted in the dataset. Citizenship for the unauthorized provides two clearly distinct but interconnected benefits that significantly impact their earnings and must be taken into account: legal standing and citizenship. We know from the largest and best study of the income effect of legalization—the 1996 U.S. Department of Labor study that analyzed the earnings of the nearly 3 million unauthorized immigrants who were granted legal status and given a road map to citizenship under the Immigration Reform and Control Act of 1986—that the average hourly wage of the newly legalized (but not yet citizen) population increased by 15.1 percent five years after legalization. Unfortunately, the Department of Labor study did not continue to measure the wage increases that the newly legalized population gained after they acquired citizenship. 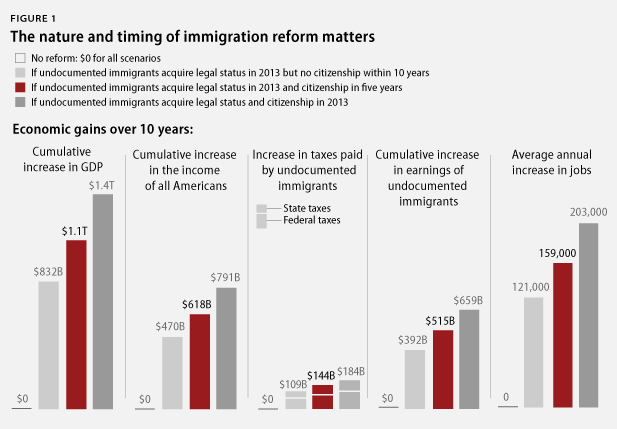 An additional income effect from citizenship would have occurred on top of the 15.1 percent income increase that followed legalization, which implies that undocumented immigrants would have gained more than a 15.1 percent increase in their earnings from acquiring both legal status and the other benefits of citizenship. For a review of studies that have shown the additional income effect of citizenship, see the appendix. Nonetheless, with an appropriate adjustment to account for the undercount of unauthorized immigrants, we can use our regression results, the Department of Labor’s 1996 study, and a set of reasonable assumptions to estimate the likely full income effect of citizenship for the unauthorized, taking into account both the legalization effect and the further increase in earnings due to the acquisition of citizenship. We can then illustrate the GDP, earnings, job growth, and tax-revenue implications of our estimate for three forms of immigration reform that could start in 2013. To estimate the effect of citizenship on the earnings of unauthorized immigrants, we decompose the income effect of citizenship that we estimated for all noncitizens—16 percent—into two components: one to estimate the percentage gain in income that the unauthorized experience as a consequence of attaining legal status and the other to estimate the percentage gain in income that they obtain from becoming naturalized citizens. We then add these components and adjust for the undercount of the unauthorized in the dataset to arrive at a likely estimate of the full income effect of citizenship for unauthorized immigrants. For the first component, we assume that the unauthorized would gain the same 15.1 percent increase in income that unauthorized immigrants experienced from 1986 to 1992 when they obtained legal status, as measured by the Department of Labor. This 15.1 percent increase in wages over five years was due to the immediate impact on earnings of the acquisition of legal status and the subsequent effects on earnings of the acquisition of more education, further mastery of English, access to a broader range of jobs, and other factors that legalization encouraged and made possible. For the second component, we hold constant the total citizenship effect—16 percent—and then calculate the effect of moving from legal status to citizenship, weighting the effect to reflect the distribution of legal and unauthorized noncitizen immigrants in our sample and the average incomes of the two groups. Our estimate of the second component suggests that previously unauthorized and newly legalized immigrants would experience an additional 10 percent gain in income if they acquired citizenship. Taking into account both components, our most likely estimate of the full effect of granting legal status and citizenship to unauthorized immigrants is an income gain of 25.1 percent. Of this boost in income, about three-fifths comes from legalization and about two-fifths is attributable to transitioning from legal status to citizenship. In each of the three scenarios we have almost certainly understated the amount of additional taxes that will be paid by undocumented immigrant workers because the tax estimates include only taxes from the increased earnings of the previously undocumented. While it has been widely documented that unauthorized workers are contributing billions of dollars in federal, state, and local taxes each year, the Congressional Budget Office estimates that between 30 percent and 50 percent of the undocumented population fails to declare their income. To the extent that some of these immigrants—who are working in the underground economy—are not reporting their incomes for fear of being discovered and deported, however, legal status and citizenship is likely to push them into the legal economy, where they will be declaring their income and paying billions of dollars in taxes in addition to the amounts that we have calculated above. The reporting of this income, however, may increase business deductions for labor compensation, offsetting part of the tax gain. In addition, some currently unauthorized immigrants who have income taxes withheld may—upon attaining legal status—file returns and claim refunds or deductions and exemptions that will offset some of the tax revenue gained from the higher reporting of income. Applying our 25.1 percent citizenship effect on the income of the undocumented, we project the economic gains from immigration reform under three scenarios. The first and most politically unlikely scenario—but one that is nonetheless useful for comparison purposes—assumes that legal status and citizenship are both conferred on the undocumented in 2013. The second scenario assumes that the unauthorized are provided legal status in 2013 and citizenship five years thereafter. The third scenario assumes that the unauthorized are granted legal status starting in 2013 but that they are not given a road map to citizenship. Under the first scenario—both legal status and citizenship in 2013—U.S. GDP would grow by an additional $1.4 trillion cumulatively, and the personal income of Americans would grow an additional $791 billion over the 10 years between 2013 and 2022.30 Over the same time period, there would be an average of 203,000 more jobs per year. Unauthorized immigrants would also be better off. Within five years they would be earning 25.1 percent more annually. As a consequence, over the full 10-year period, the formerly unauthorized would earn an additional $659 billion and pay at least $184 billion more in federal, state, and local taxes—$116 billion more to the federal government and $68 billion more to state and local governments. Under the second scenario—legal status in 2013 followed by citizenship five years thereafter—the 10-year cumulative increase in the economy of the United States would be $1.1 trillion, and the annual increases in the incomes of Americans would sum to $618 billion. Over the 10 years, this immigration reform would create an average of 159,000 jobs per year. Given the delay in acquiring citizenship relative to the first scenario, it would take 10 years instead of five years for the incomes of the unauthorized to increase 25.1 percent. Over the 10-year period, they would earn $515 billion more and pay an additional $144 billion in taxes—$91 billion to the federal government and $53 billion to state and local governments. Finally, under the third scenario—legal status only starting in 2013—the cumulative gain in U.S. GDP between 2013 and 2022 would be a more modest $832 billion. The annual increases in the incomes of residents of the United States would sum to $470 billion over the 10 years, and the economy would have an average of 121,000 more jobs per year. The income of the unauthorized would be 15.1 percent higher within five years. Over the 10-year period, they would earn $392 billion more and pay an additional $109 billion in taxes—$69 billion to the federal government and $40 billion to state and local governments. The positive economic impacts on the nation and on undocumented immigrants of granting them legal status and a road map to citizenship are likely to be very large. The nation as a whole would benefit from a sizable increase in GDP and income and a modest increase in jobs. The earnings of unauthorized immigrants would rise significantly, and the taxes they would pay would increase dramatically. Given that the full benefits would phase in over a number of years, the sooner we grant legal status and provide a road map to citizenship to unauthorized immigrants, the sooner Americans will be able to reap these benefits. It is also clear that legalization and a road map to citizenship bestow greater gains on the American people and the U.S. economy than legalization alone. Robert G. Lynch is the Everett E. Nuttle professor and chair of the Department of Economics at Washington College. His areas of specialization include public policy, public finance, international economics, economic development, and comparative economics. He is the author of several papers and books that have analyzed the effectiveness of government economic policies in promoting economic development and creating jobs. He holds a bachelor’s degree in economics from Georgetown University and a master’s degree and doctorate in economics from the State University of New York at Stony Brook. Patrick Oakford is a Research Assistant at the Center for American Progress. His research focuses on the economics of immigration policy, labor migration, and the intersection of immigration and employment laws. Patrick received the award for best dissertation in the field of migration studies in 2012 and his work has appeared in The New York Times, National Journal, and The Hill. He holds a master of science degree in migration studies from the University of Oxford and a bachelor’s degree in industrial and labor relations from Cornell University. This study was made possible by the generous support of the JBP Foundation. The views expressed are those of the authors and not necessarily the JBP Foundation. The authors would like to thank John Schmitt, Michael Ettlinger, Heidi Sheirholz, Josh Bivens, Angela Maria Kelley, Marshall Fitz, and Philip Wolgin for their helpful comments and suggestions. Pastor and Scoggins found in their 2012 study that naturalized citizens in 2010 earned 11 percent more than legal noncitizens after controlling for factors other than citizenship that may be responsible for their income differences. Pastor and Scoggins wanted to measure the effect of citizenship on legal noncitizen immigrants only and attempted to control for the influence of unauthorized immigrants by using several controls. This is important to note because the earnings increases from citizenship for unauthorized immigrants may be higher than they are for legal noncitizen immigrants since the undocumented receive two distinct sets of benefits—the benefits of legal status and the benefits of citizenship—whereas legal immigrants gain only the benefits of citizenship. In fact, a 1996 U.S. Department of Labor study suggests that the earnings gains for unauthorized immigrants from legalization alone may outstrip the earnings gains from citizenship for already-legal immigrants. Given that the income effect that Pastor and Scoggins estimated did not attempt to measure the income effect of citizenship on all noncitizens—as well as the probability that, if used as a proxy for such an effect, their income effect would probably understate the income effect of citizenship on all noncitizen immigrants—their estimate should not be compared directly to ours. Unlike Pastor and Scoggins, we sought to measure the citizenship effect on all noncitizen immigrants. Shierholz’s 2010 study measured the income effect of citizenship on all noncitizen immigrants, not just on legal noncitizens. Hence, her estimate can be compared to ours. Using data from 2006 to 2007, Shierholz found that naturalized citizens had family incomes that were about 15 percent higher than the family incomes of all noncitizen immigrants once factors aside from citizenship were taken into account. In his 2008 study, Akbari, found a wage effect of citizenship for legal immigrants from developing countries—who represent the large majority of U.S. immigrants—that varied from about 9 percent to 12 percent depending on the specification he used. Akbari explicitly attempted to control for the biasing effect of the presence of unauthorized immigrants in the dataset he used by excluding Mexican immigrants because a large number of them are unauthorized. Because the dataset excludes most of the undocumented, Akbari’s estimate of the income effect of citizenship on legal immigrants probably understates the income effect of citizenship on all noncitizens and should not be used as a proxy for such an effect or compared to our estimate. In a 2002 longitudinal study, Bratsberg, Ragan, and Nasir followed a sample of 332 young male legal immigrants from 1979 through 1991 and found that citizenship was associated with a wage gain of around 5.6 percent. They measured the impact of citizenship on legal immigrants only, and their results therefore probably also understate the citizenship effect on all noncitizen immigrants. This much older cross-sectional study done in 1978 using 1970 Census data found that citizenship had a 15 percent effect on the earnings of foreign-born white men. But the effect of citizenship fell to 7 percent and lost statistical significance once he controlled for the duration of residence in the United States. Given that white men constitute less than 8 percent of noncitizen immigrants today, however, it is not clear how relevant this study is to the present circumstances. In a 1992 analysis using 1980 Census data on foreign-born men of all races, Chiswick and co-author Paul Miller reported a significant income effect of about 4 percent. These latter three studies probably understate the benefit of citizenship because they exclude women, for whom the citizenship effect was found to be larger than for men in both the Shierholz study—17 percent for women versus 12 percent for men—and Pastor and Scoggins study—13 percent for women and 9 percent for men— It was also larger in our estimates.